Everything and everyone is becoming increasingly interconnected. When Vannevar Bush first modeled the modern day information system through his Memex machine (memory extension), as published in his 1945 essay As We May Think, he was in fact thinking about the way in which ideas emerge from the process of associative thinking or hyperlinks. A sequence of ideas manifests itself as a “trail of associations,” describing the way we think as non-linear, non-sequential creative invention. Much like Charlie Parker riffing on a blues theme, the human brain hyperlinks from one thought to another. This is how the mind works and how the computer and its circuitry was originally designed. 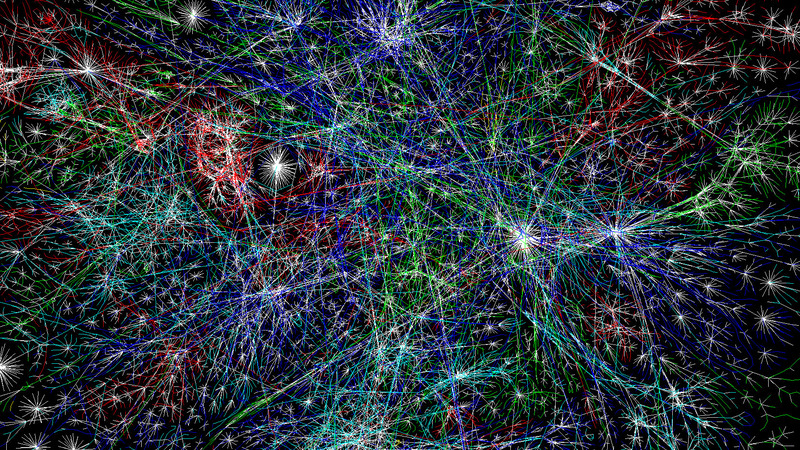 So it is no surprise that the Internet, a network of networks, has blossomed over the years into a cosmological constellation that in its labyrinthine complexity of pathways and trajectories, more and more resembles the structure of the human brain. This is because the digital computer in its original conception was conceived as a remaking of the human brain, modeled after the network of neurons and synapses that route activity of the human mind. The mind is in fact a Network of Networks, constellations of paths that carry the brain’s activity from one place to another. The Network of Networks thus becomes a compelling model for organizing and synthesizing creative activity. If each of us in our embrace of the network has carved our own space for proclaiming the latest idea, concept, rumination or rant, how can these utterances become filtered and aggregated into a large arena of exchange and dialogue? Are the content producers of the world who pour themselves daily into the Net bound to be isolated and self-contained? How can we make our daily articulations transparent, woven into a tapestry of the like-minded. How can we co-mingle with our colleagues to generate collective action via the Network of Networks? This may be the most urgent problem facing those of us who contribute to the vast swath of information that flows daily across our screens and around the globe. We need to aggregate! That is the new call-to-action: to aggregate our individual creative output into the collective third space, where real action takes place. If in fact information is the currency of our time, it’s time we bank on our artistic research and production through the power of collaboration. Aggregate! That is the power of Collective Agency, the Network of Networks and the mind at work.